Published: Saturday, November 21, 2015 at 6:15 a.m.
Stephen and Cyndy Alling run All Things Auctioneers, a business specializing in online sales, estate and business liquidations and consignments in Lyman. 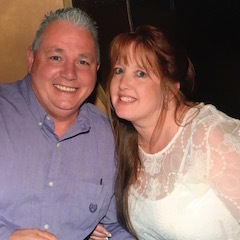 Stephen and Cyndy Alling own and operate All Thing Auctioneers, a Lyman business offering services in estate auctions, personal property auctions and business liquidations. Stephen, a licensed auctioneer, and Cyndy, the business manager, have run the company out of their home for three-and-a-half years. The couple spends most workdays visiting homes and businesses across South Carolina to inventory items for online onsite auctions as well as some in-person auctions. Cyndy: We used to go to auctions together and enjoyed it. One day (Stephen) was like, “I could do that.” And then he went and got licensed, so he’s the mouth and I’m the mind. Stephen: That’s what we wanted to do — own our own business together, where we work together every day. Stephen: Everything we mainly do is online, through online estate auctions as well as online personal collectible auctions. Cyndy: We also do our own packaging and shipping of items here. We ship to the whole United States, so people can be in California as well as the local. Stephen: If you look up allthingsauctioneers.com, you’ll see exactly what we have. People can look at our page and see how many estates we’ve done and see our references. There is an estate auction in Anderson coming up, and what we do is go through the whole house and take a picture of every single thing. So it’s an online, live auction. Cyndy: The online auctions last about four to seven days. Cyndy: There are so many items. It’s a lot and usually we have 200 to 400 items at one time. People can go online and might not even know they want something but still bid on it. We usually start everything at $2 and people will end up bidding on multiple things. Where else can you get all this nice jewelry or things for a fraction of the cost? Stephen: It’s like auction fever. Cyndy: It used to be more non-locals, but the more estates we do, the more locals we see because we don’t ship furniture. It’s probably 50/50. It depends on what it is, too. If we just do a consignment, it’s usually smaller items and we’ll ship it out. More people tend to be interested in collectibles or jewelry or crazy things. That’s why we try to tell people not to throw anything away, because you would be shocked at what people buy — from postcards to old letters. A lot of people are also into furniture now and restoring and painting it. So stuff we never could move like old dressers are going for crazy prices. But things come and go with different fads. Cyndy: The estate auction that we’re doing now, the people are from Ohio and their brother died and he lived here. They don’t have time to empty the house. Most people would throw it all out, but they’re calling people like us in and we do it from start to finish, emptying the whole house and getting it ready to move. Stephen: It is very hard to throw anything away. If you remember your mom drinking out of this coffee cup, it might be worth $10,000 to you. Sentimental stuff is hard to get rid of, and we deal a lot with sentimental things. We sell everything that’s sellable, whatever isn’t we donate and then we haul off the trash, too. It’s a service that totally cleans the house out for people to be able to sell the real estate. Staff writer Alyssa Mulliger compiled this report.